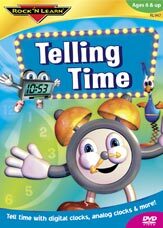 Telling Time starts off easy and gives clear examples along with lots of humor and musical entertainment. Kids learn to tell time to the half hour, quarter hour, five minutes, and eventually to the minute. We’ve provided plenty of practice so that students build their skills every time this program is used. As a bonus, we’ve included days of the week, months of the year, and how calendars work.